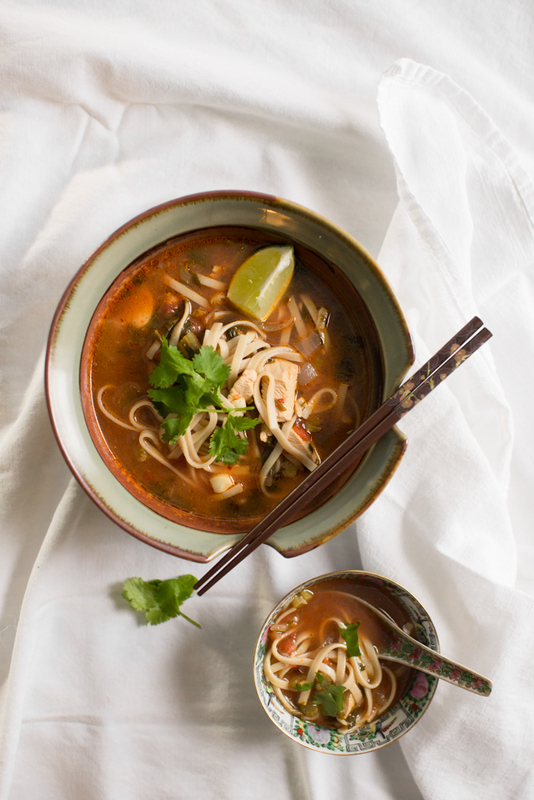 We love this recipe for chicken noodle soup with kicked up Asian flavors. We found the idea for this recipe in "One Dish Meals" by Food and Wine Magazine. I made some adjustments to make the recipe MUCH faster to prepare! Make it mild for your young tasters, and serve with a dash of Sriracha (Asian hot sauce) to satisfy those who enjoy extra heat! Some of the ingredients, like the udon noodles, fish sauce and Sriracha can be found in the Asian aisle of your grocery store (I found everything at Wegmans). Shopping for these ingredients at an International or Asian market may save you even more money and offer a wider variety of choices. In a large soup pot, heat both oils at medium heat. Add onion, celery, garlic, ginger, cayenne pepper, and red pepper flakes and cook for 5 minutes, stirring occasionally. Add the broth, crushed tomatoes, chicken, and fish sauce, cilantro. Bring to a boil. Simmer for 15 minutes. Add noodles and cook for an additional 4 minutes, or for the cooking time recommended on the package of noodles you are using. Add salt to taste. Add bok choy and cook another 1-2 minutes until soft. Serve with chopped cilantro, lime wedge, and Sriracha for extra heat. Soups are a great third stage food for babies and toddlers. Remove a portion of noodles, chicken and greens before adding the red pepper and puree in a blender or mini food processor. Add additional broth to achieve the consistency that your baby is comfortable with. Older toddlers may enjoy the soup as is, with the noodles cut up in smaller pieces.